Our wonderful champion has crossed over the Rainbow Bridge. 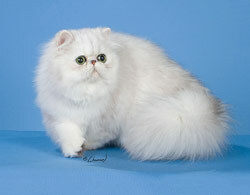 The best place to find Persian and Himalayan cats and Persian and Himalayan kittens. These cats are all very loved and well cared for. Cherrybirdie is owned and operated by myself and my husband, Cheryl and David Riley and I have been breeding cats since 1993, showing them since 2003 and really enjoy it. Breeding cats is something that I have known I wanted to do all my life. Because of this, you might say that these cats and kittens are spoiled and raised with lots of love, attention and handling, all inside our house. Most have been shown in CFA and some in TICA. My cattery is CFA registered and I’m also a member of TICA (The International Cat Association). I am a member of the CFA Breed Council. I raise Silver Persians, Himalayans, occasional Goldens and Persians of other colors. We are breeding first and foremost for Health and when possible, the Show Standard. Some of the lines I work with are from such well known catteries for Persians as: Missionhill, Brettachtal, Ultamint, Labrese, Scrimshaw, Castlegate and Dalee. My Himalayan lines include Uno Belgatto, Prancenpaws, Laureden, Purrpals, Sandypaws, Catsafrats, Countrygal and Darling Purs. 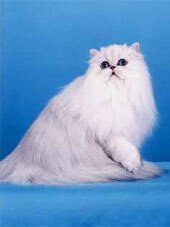 A silver persian has several qualities that make it a special type of a persian. One of the most outstanding features is that they have “permanent make-up” which consists of black eyeliner, lipliner and nose liner. They have brick colored noses and their eye color is usually green or blue-green which is required for showing them. There are two types of silver persians, a Shaded Silver and a Chinchilla Silver. They both have white undercoats but the Chinchilla silver just has silver tips on the very ends of the hairshaft making it appear more like a white cat, whereas the Shaded Silver has the tipping going down further on the hairshaft for some darker highlights. Although I own and co-own several cats, only 3 live with me.